Save big on your tux rentals and forward the savings to other expenses for your wedding or upcoming formal event. Tuxedo Rental Near Me: We deliver anywhere in the US - tuxedo rental near you. If you’re on the lookout for one of the best deals on a tuxedo, our cheap tuxedo rental guide will set you on the right track. We’ll tell you how to build an affordable tuxedo package for under $60, and we even include a special offer code to upgrade your tuxedo package absolutely free – getting you beyond the maximum value for your dollar. The highest of quality tuxedos are now available direct to you at wholesale prices. If you're concerned about pricing the tuxedo builder is an excellent option for keeping tux rental costs low. See below for more details on how you can save money when renting with National Tuxedo Rentals. We offer a free tuxedo for anyone who plans to rent with a group of 5 or more other people (even if you all pay separately - that's okay). For more details, see our free tuxedo & suit offer. Everyone is skeptical when buying ‘cheap’ – so let’s quick answer a few questions that you’ll naturally have about low priced tuxedo rental options. Is renting a tuxedo expensive? It can be expensive to rent a tuxedo, but it doesn’t have to be, and it isn't at National Tuxedo Rentals. You can expect to pay $140 - $240.00 for the same tuxedo rental at the big tuxedo rental chain store. However, at NationalTuxedoRentals.com, you can rent a complete tuxedo package and have it shipped directly to your door for $79, which includes a FREE return shipping label to send it back. $79 sounds really cheap for a tux, so what’s included? Short answer - Everything but your shoes! Are cheap tuxedos any good? Our tuxedo prices are the cheapest online and off, but our tuxedo quality is still of the highest in the industry. We take great pride in the tuxedos we assemble for our customers. We have never received a complaint about the quality of any tuxedo we have rented – at any price. To us, that’s a clear sign that our customers are satisfied – and we think you will be to. Additionally, if brand names get you excited, you’ll be happy to know our $79 tux package includes options from Perry Ellis, Claiborne 2.0, After Six, Jean Yves, CARDI, CHAPS-Ralph Lauren, and other top formalwear designers. Here’s how to rent our $79 tuxedo package. It’s so incredibly easy, fast and cheap! 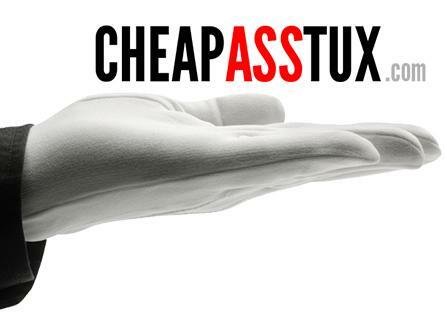 CheapAssTux.com is a website where you can purchase tuxedos and formal wear for up to 90% off the retail price. Their business model is exactly what it says on the tin. You'll find highly affordable tuxedos and accessories for very low prices, and the products are yours to keep forever. There are other options for low priced tuxedos as well, let’s take a look at some of them, and the various pricing options. That brings you to a total of $46.50. You can also add shoes, a vest or cummerbund – though it will raise the cost a bit. Note: cannot be done via tuxedo builder. Perhaps you decide you want to go coatless, but decide to maximize your dollars – you can skip ordering pants and just go with a shirt, tie, and formal jewelry. Or perhaps you could use the extra cash to spend on a tuxedo vest or cummerbund. Keep in mind creative ways like this to maximize your value and minimize your budget. Are there any items in your wardrobe that you can substitute? Be careful though, there is a difference between a suit and a tuxedo – and if you end up substituting too much, you’ll be looking ready for business, not ready for black tie! A lot of times we tend to gravitate towards what we know. Consider this: Calvin Klein makes a wonderful tuxedo, to be sure - and you buy their products expecting a certain level of quality and know you'll be satisfied. That's totally valid and a great way to shop for products you know you'll like - there is something to be said for trust in a brand name, and you pay a higher rate for that convenience of familiarity. However, the top designer brands arent the only people who can make a great tuxedo. In fact, every product we carry meets a certain level of quality standards we set for our catalog. So, if you like a tux from a top designer, why not find a similar one from another company for less? It's an effective cost-saving strategy that our savviest customers take advantage of. And if you're not willing to give up your favorite designer brand just yet, rest assured: NationalTuxedoRentals.com offers the lowest prices you will ever find on designer brand formalwear.